I had heard so much from other bikers about Bulgaria – spectacular scenery, light traffic, good roads, lots of history, friendly folks – I thought I’d spend the last month of the trip starting in Sofia (the capital) in the far western part of the country, and do a loop around the country. The route took me through the heavily wooded Rhodope Mountains in the south, along the beach resorts of the Black Sea coast almost to the Romanian border, then west along the foothills of the Balkan Mountains in the north. 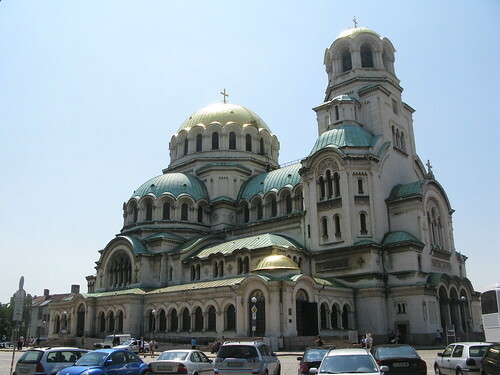 SOFIA - The big attraction in Sofia is the St. Alexander Nevsky Memorial Church, completed about 1900 in gratitude to the Russian people (Alexander Nevsky was a 13th-century Russian prince regarded by the Russian people as their greatest national hero.) Because Russia helped Bulgaria in the 1870′s throw out the Ottoman Turk occupiers of Bulgaria, the Bulgarians even today have an abiding fondness for the Russians. The city itself is quite pleasant and liveable with an interesting assortment of architectural styles and monumental buildings reflecting the Greek, Roman, Byzantine and Ottoman occupations. PLOVDIV - Plovdiv is Bulgaria’s second-largest city, after Sofia. There is evidence of permanent settlements here dating back to the 7th millenium BC. It was part of the Roman Empire from the 1st to the 4th century and really flourished under the Ottomans in the 14th century. During the Bulgarian National Revival that tookj place during the mid-19th century, Plovdiv was at the center. 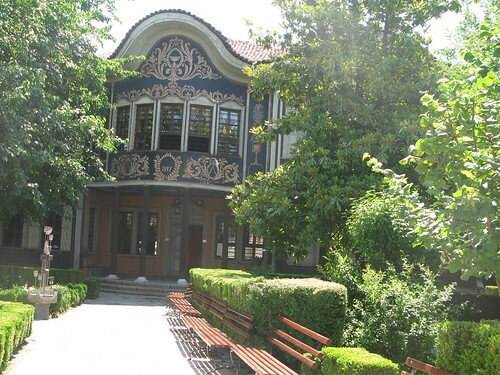 Bulgarians developed an impressive architectural style of their own as you can see from the pictures of some of the residences still in use today. 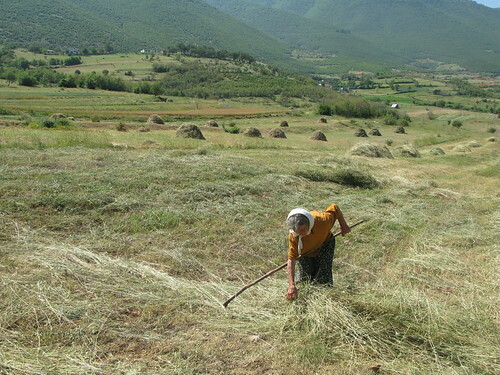 Here are some more photos from Plovdiv and the surrounding countryside. BACHKOVO MONASTERY and the FORTRESS OF ASEN - Twenty miles south of Plovdiv, in the foothills of the Rhodope Mountains, is the Bachkovo Monastery, one of the oldest Bulgarian Orthodox monasteries in Europe. 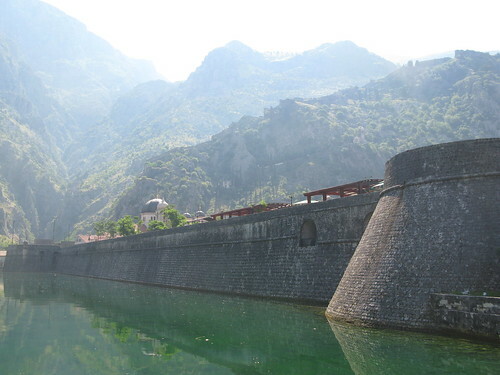 It was founded in the 11th century by a commander in the Byzantine army. 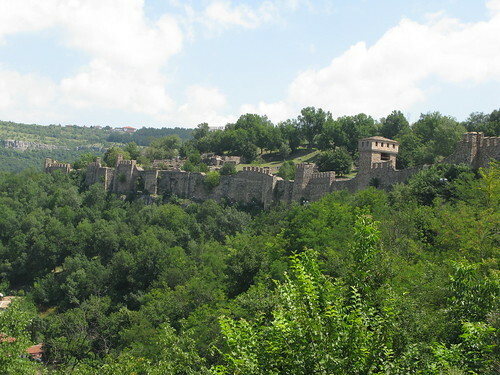 Nearby is the Fortress of Asen which dates back to the Thracian period. The fortress was overrun during the Third Crusade, the one led by Richard the Lionheart. 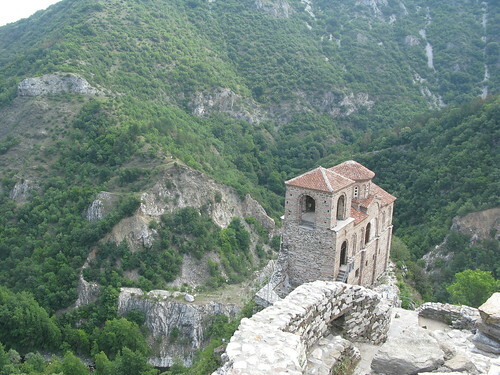 Here are some photos of this interesting monastery and the ruins of the fortress, including the Church of the Holy Mother of Petrich, the only surviving building of the original 12th-century fortress. 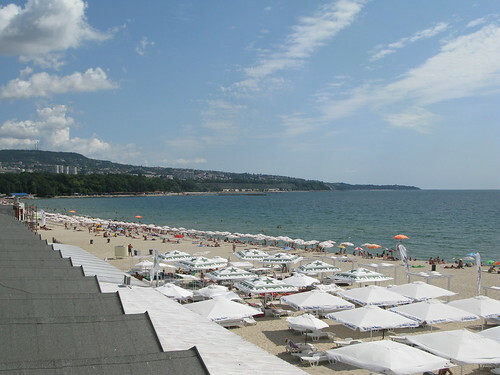 VARNA and the BLACK SEA COAST - The road from historic Nesebar on the south Black Sea coast up to Varna in the north is made for motorcycling. 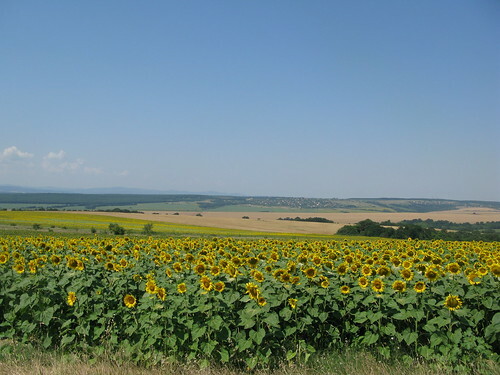 Lightly traveled, it switches from fabulous views of the endless beaches and ocean to occasional jaunts up into the wooded hills and prosperous farms of eastern Bulgaria. Varna itself is one of the most pleasant and interesting cities I’ve visited on this trip and I went out of my way to tell the Director of the Archeological Museum that I thought it was the finest one I’d seen in the Balkans. It would be worth the trip just to spend time going through it, as I did twice in successive days. Here are a few of my favorite photos from the Black Sea coast. 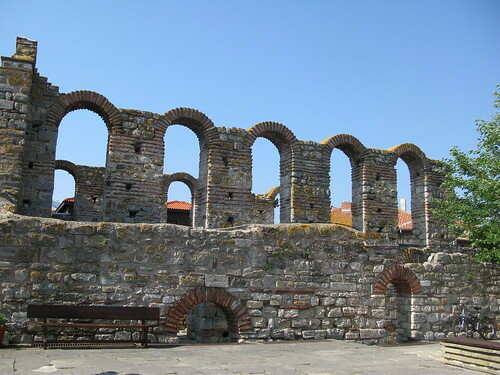 NESEBAR - Set on a rocky peninsula that juts out into the Black Sea, Nesebar was first settled by Thracians in the first millennium B.C. but reached its commercial peak in the 13th and 14th centuries. The Old Town is packed with Byzantine churches, many still standing. Here are a few of the notable Greek, Russian and Bulgarian Orthodox churches, a couple of which go back to the early days of the Byzantine Empire (c. 7th century A.D). 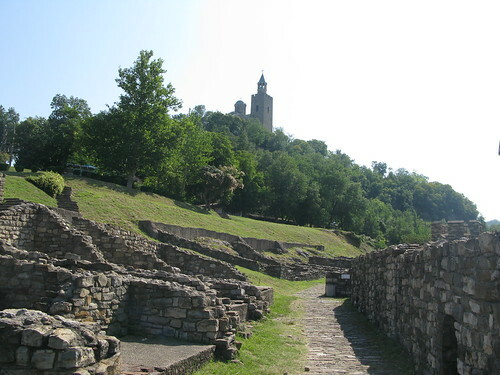 VELIKO TURNOVO - The big deal about Veliko Turnovo, the powerful capital during the Bulgarian Second Kingdom (1185-1393 A.D.) is the immense and majestic Tsarevets Fortress, built in the 12th century. When the Kingdom finally fell to the Ottomans in 1393, Tsarevets was reduced to rubble. Only a few of the buildings have been restored but much of the fortress wall is original. Here are a few more photos of Tsarevets Fortress. 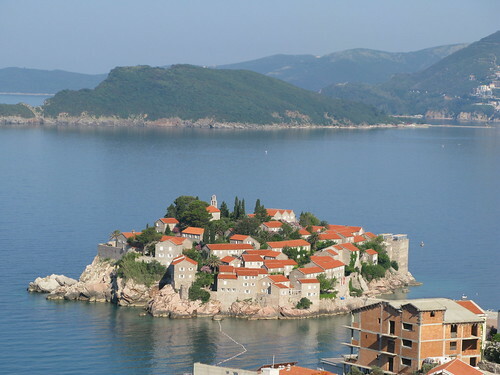 Because Montenegro sided with Serbia as Serbia’s only ally in the 1990s Yugoslav wars, Montenegro is still regarded with some suspicion around the Balkans. Trying to get Montenegrins to open up about their role in the war usually gets just a shrug and some variation of “That was a long time ago. We’re trying to move on.” And in fact they have been clearly distancing themselves politically from Serbia, their former patrons in the region, over the past ten years. It was interesting to contrast that reaction with those of average Croatians, who still want no part of Serbia or Montenegro. 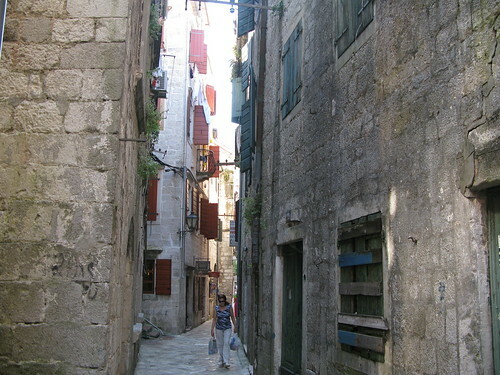 The hot-button issue that still infuriates the Croatians was the joint Serbian-Montenegrin shelling of the Old Town section of Dubrovnik in 1994, an outrage that seems so unbelievable today. Beyond politics and the bitter memories, Montenegro has opened up and is once more the beach-and-sun playground of hundreds of thousands of Europeans every summer, mostly from the Balkans but a growing number also from Italy, Germany and the U.K. It’s a beautiful country inland as well and I had more fabulous riding along the coast and into the mountains of Montenegro. A real highlight of this part of the trip was the ride around the Bay of Kotor, ending up in the ancient town of Kotor, its roots going back to the Romans, Byzantines and Ottomans. The ride to the top of Mt. Lovcen was a bit hairy (25 switchback turns) but well-worth the effort. Check out the high-altitude views of the Bay of Kotor, it was spectacular from up there. Here are a few photos of the ride from Dubrovnik, around Bay of Kotor, and then the Old Town section of Kotor. Leaving Montenegro, I lucked out with perfect riding weather as I rode through the scenic and peaceful Dinaric Alps of Albania, Kosovo and Macedonia. People along the way were incredibly friendly, helpful and alway curious as they rarely see outsiders in this part of the Balkans. Here are a few of my favorite shots from that memorable eight-day ride. Robert, a tall, fidgety English guy in his late thirties, came over to introduce himself and join our conversation. I was trying with little luck to get information from the non-English speaking owner of our guest cottage about the capital of Montenegro. “How are you traveling?” I asked. He pointed out all his improvised fixes and added features, including a small solar charger. “What’s the charger for?” I asked. “What’s the cell-phone for?” I asked. “Well, every now and then I like to call my wife and son back in Manchester to check in occasionally.” he replied matter-of-factly. “You have a wife and kid and you’re riding around like this for two or three months?” I asked, a little surprised. “I need to do it, mate.” he said as he constantly moved and fidgeted, puffing impulsively on his hand-rolled cigarette. He reached under the small patio table and lifted up a large, plastic bag and set it on the floor in front of me. I immediately thought he was dealing in hashish or something. I opened the bag and saw a tightly compacted mass of tobacco, about the size of a beach ball. I couldn’t help but laugh at the ridiculous sight of it. He carefully laid out a small patch of tobacco in the little tray, closed the tray, pushed a lever and out came a brand new cigarette, complete with filter. “Pretty good markup!” I said. As he puffed and fidgeted, he started telling me about some of his travels, frequently tapping me nervously on the side of my shoulder as if to assure himself I was giving him my full attention. “But doesn’t the long travelling get expensive?” I asked. Albanian blood feuds are a peculiar tradition in that region, dating back to the 15th century. Some powerful chieftain in the area instituted a detailed code, called the kanun, of about 1200 rules covering everything from marital relations to finances and village disputes. The highest virtues, it proclaims, are honor and hospitality. If a man murders another man, the victim’s male family members are bound by honor to kill the murderer or any other adult male member of the murderer’s family. If there are none, he must go to the extended family to find some adult male to kill in order to preserve the family’s honor. In other words, if you kill someone, you put a lot of people at risk. The accused murderer is entitled to protection at a “safe house”, usually his own home. As long as he stays inside, he’s protected by the kanun. But if he steps foot outside his house, he becomes fair game. There are instances where the victim’s family members have moved and live within eyesight of the safe house. They keep vigil so they can shoot the man if he dares to step outside. This terrifying stalemate can go on for years. “With a knife, man!” he blurted out, still unable to believe it himself. “Jesus”, I repeated. I dropped the subject. I didn’t want to hear any more details. It was an over-sized greeting card filled with about a hundred different written messages from people he had met along the way. “Look”, he said, here’s one from South Africa, here’s one from Turkey, one from Algeria” as he carefully pointed each one out. The card was a mess from all the re-rolling and packing and the cover had a pointless picture of a bunch of yellow ducklings. “What’s with the ducks?” I asked. As I read the messages to Sebastian, I began to realize that this was indeed Robert’s gift. Robert’s world was chance encounters with random strangers, reaching out to anyone who would listen to him, living for those moments of joyful communication wherever he might find them. He keeps his memories but little else. These spontaneous encounters are Robert’s stock-in-trade. They’re his currency. I kept reading and found myself suddenly moved at the warmth of some of the messages and at Robert’s determination to make Sebastian a real gift. In fact, he was giving Sebastian everything he had. I looked up at Robert, fidgeting and smoking. He was waiting for my reaction to his card. “Robert”, I said, ” this is the best birthday gift I’ve ever seen”. And I meant it. “This one’s right from the heart, isn’t it?” I said, feeling a little emotional abouth the whole thing myself. I don’t know you yet, but I’m glad you are here. There’s something profound there. I just wish I could put my finger on it.